This recipe for easy chicken chilaquiles is a skillet full of spicy comfort food, full of chicken and tomato with tortillas cooked right in! So break out your cast iron skillet (or whatever skillet you have on hand) and get ready for some sassy deliciousness. 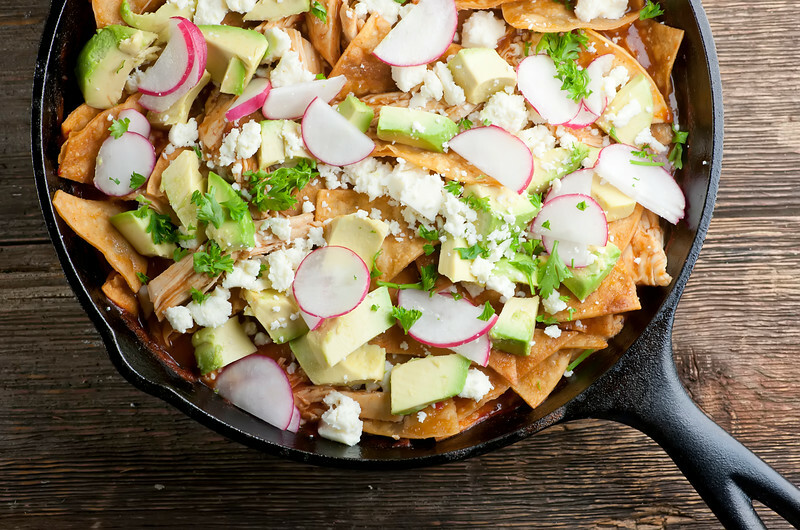 Where to start with this super easy, immensely satisfying recipe for chicken chilaquiles? First is the fact that is is a spicy conglomeration of tender chicken, creamy avocado and bright radishes in a sassy taco sauce, with tortilla chips simmered right in and just the right amount of cheese to finish things off? Second, that almost all of it takes place in one skillet? Third that it involves making your own tortilla chips, which are SO easy and SO addictively good that it may ruin all other tortilla chips for you? Never mind, I won’t try and decide which of those things is the best…let’s make it! Recipes that involve one skillet or pan really are some of my faves, and in this case I just brought the pan to the table and we helped ourselves right on to our plates. This way everyone got to get exactly what they wanted in terms of all the many delectable things that are going on in this recipe. From the chicken to the tortillas and everything in between, it’s a treasure trove of tastes. I think having chicken chilaquiles gives me a sense of how the dog feels when her Bark Box arrives. SO MANY EXCITING THINGS INSIDE! MUST JUMP IN AND EXPERIENCE ALL OF THEM RIGHT THIS VERY MINUTE! PLEASE OPEN BOX RIGHT NOW! 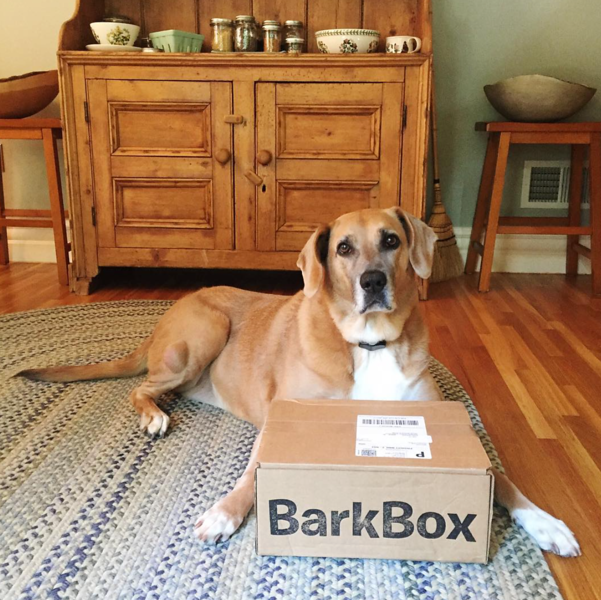 Disclaimer: the Bark Box people don’t know me and I don’t know them…I just love the fact that this box of dog excitement made her so happy – yes, that is her happy face, she’s a hound dog- and if you want to try it out for your own pooch, use this referral code and you will get a free box with your subscription. I also love that her box came on the exact same day as my Stitchfix box – which is a box full of excitement for me! Maxi dresses for me, lamb and cheese soft chew treats for her, everyone wins! Start your skillet full of spicy happiness by making a quick batch of your own tortilla chips. Now, you CAN use store-bought chips, but I’ve found that they get a little too mushy to give the nice chewy texture that you want with chilaquiles, and it takes almost no time to bake up a batch. All you do is cut up corn (corn, not flour please) tortillas into triangles, toss them with a little oil and salt and bake them for about 20 minutes until they are crisp. Take them out and guard them for all the kitchen interlopers who will try and snag them for themselves. They are seriously the best tortilla chips you are ever going to taste. Sorry/not sorry for ruining the bagged kind for you. This recipe for easy chicken chilaquiles is a skillet full of spicy comfort food, full of chicken and tomato with tortillas cooked right in!Click to TweetNext, empty your favorite taco sauce into a deep 12 inch skillet, and here is where you can make things very spicy, medium spicy or (raises hand) mildly spicy, depending on what kind of sauce you go for. Nestle some boneless chicken breasts into the sauce, cover the skillet and simmer it until the chicken is just cooked through. Take the chicken out and shred it into nice bite-sized pieces. I like to shred instead of cut because the chicken gets nice rough edges that way, the better to hold the sauce. Now put it back into the sauce and pour your tortilla chips in too. Stir everything around until the chips are all tucked into the sauce, cover the pot and put it on the lowest possible simmer for 5 minutes – you want the chips softened but not mushy. Here’s where things get really fun, because now you get to add whatever toppings catch your fancy. I like thin radish slices, chopped avocado, a generous handful of queso fresco (mild Mexican cheese) and some chopped parsley, but you get as creative as you want. Shredded jack cheese, chopped onions or scallions, sour cream, guacamole, chopped iceberg lettuce…all of those would be fabulous. And if you go for the “everyone serve themselves out of the pan” method, you’ll be just as happy after dinner when there is just one skillet to wash! Preheat oven to 420 and line a rimmed baking sheet with foil. Toss tortilla wedges with oil and lay in a single layer on baking sheet. Sprinkle with salt and bake until crispy, about 5-10 minutes (watch them closely so they don’t get too browned). Set aside. Pour taco sauce into skillet and lay chicken in one layer in the sauce. Cover and simmer over medium heat until chicken is cooked, about 15 minutes, turning chicken over as it cooks. Remove chicken and shred into bite sized pieces. Return chicken to skillet and add tortilla chips. Stir until everything is well mixed into the sauce. Cover and simmer over low heat for 5 minutes until chips are just softened. Top with all remaining ingredients (or substitute in your own favorites!) and serve! Your fur baby is certainly lucky! How exciting that her package and yours arrive the one day? Yay! Those homemade tortillas are brilliant! Definitely my kinda meal and given that Friday is right around the corner, it’s good timing too for weekend eats ;) !! Awww, your dog is adorable. And glad that bark box could make her happy! :) That skillet looks gorgeous. 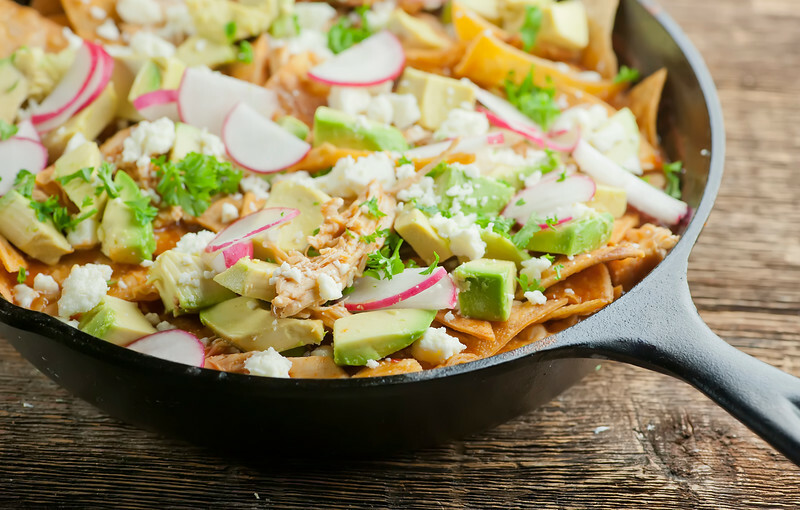 Love how easy delicious and full of awesome flavours this Chicken Chilaquiles is! I’ve never made my own chilaquiles before. This is so satisfying! And I really like that you make you own tortilla chips for it. They’re always so much better!